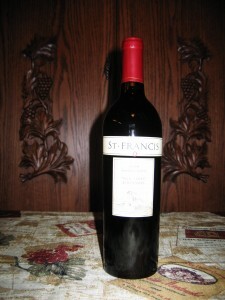 Cutting: An excellent medium bodied Zinfandel with black cherry, pepper and raspberry characteristics. Briary black cherry, pepper and raspberry aromas and flavors highlight the St. Francis Old Vines Zinfandel from Sonoma County. Some tasters observed coffee and cola characteristics. This is an excellent Zinfandel with good complexity that most Zinfanatics should enjoy. A good value.